One of the best places to have a mirror is in the dining room. Restaurants have mirrors to make the dining area look more expansive and to help brighten the space. You can also do this at home. Place a big mirror where it will reflect the light fixtures and the food served at the table. In feng shui, this position in the dining room attracts positive energy and fortune to the family. An oversize mirror works well in this space. It has a strong, thick border frame that gives enough support to the massive glass. The sheer size of the mirror reflects most of the areas in the room. It reflects a nice view, which is the artwork, and the pin lights and candle holders. The black frame is a great contrast to the neutral color scheme of the room. It is a beautiful statement piece in the dining room. 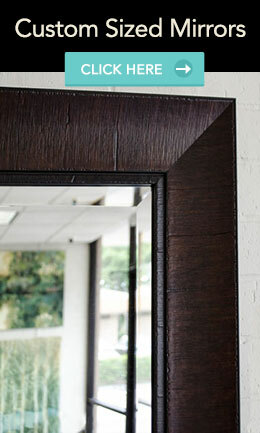 Secure a large beveled framed mirror against a rich colored wall. The beveled frame adds a unique dimension to the space and the mirror brings chic and elegance to the room. It is bright with a touch of feminine flair which enhances the style of the dining room. The mirror reflects a window, bouncing off natural light in the area. 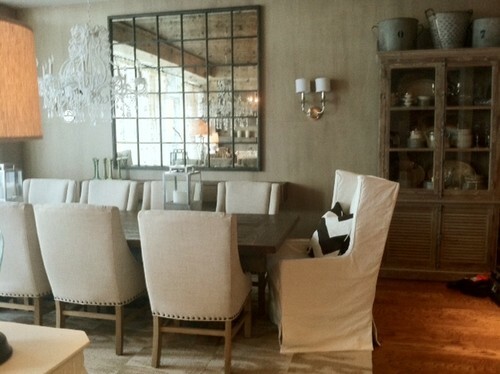 Enhance the style of the dining room by incorporating a mirror that has the same style as the room. This dining room has an elegant and rustic style which uses metal buckets, heirloom china, and other accessories to create a shabby chic look. The antique mirror blends well in this dining area. 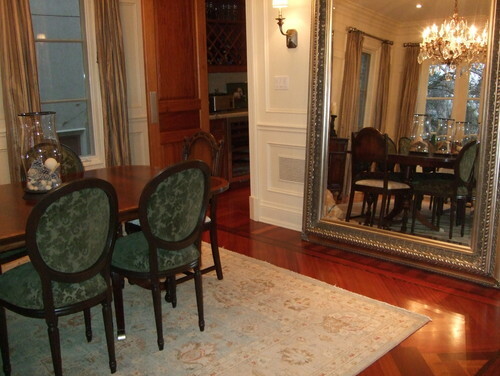 A huge mirror with an elegant frame works well in this formal dining room. A mirror in this size is usually custom made and you can check with a local mirror shop to create one for you using the dimensions and frame material that you prefer. When using a floor mirror, make sure that it is secured to the wall for safety purposes. You can ask a professional to install a large mirror in your room. A narrow dining room benefits from this floor-to-ceiling mirror. The mirror lengthens the space and reflects the whole area, including the huge canvas art on the opposite wall. If you have a tiny room, don’t be intimidated by using large mirrors. A big mirror creates the illusion of more space and help reflect any light coming into the room. MirrorLot manufactures large, oversize mirrors for home owners, interior designers, and decorators. It has a wide variety of frames to choose from to fit any room style. Visit the website at www.mirrorlot.com to know how MirrorLot can help you in your design needs.